Traditional panel painting is a very beautiful art that has been lost to the contemporary world which Ms. Parun has elected to revive. Gilded panel making was practiced in Europe in the 16th and 17th centuries by Giotto and Cellini. Traditional panel making is a combination of goldsmithing, bas-relief, painting and sculpture. It is a medieval art rarely seen outside of the Gothic cathedrals of Europe. Preparing the Surface: Ms. Parun has revived the lost art of the gilded finish. 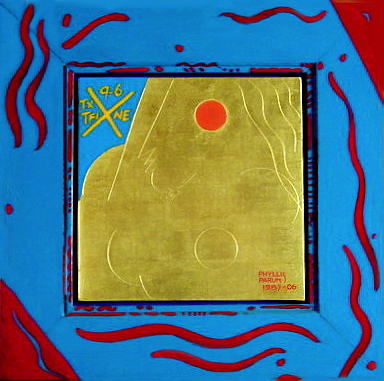 Beginning with a 12”x12” square birch panel, in the Italian gilding tradition, Ms. Parun placed fine muslin over the wood. After she mixed and cooked the gesso, it was laid over the muslin and wood, layer by layer, until 14 layers had been laid. Each layer was allowed to dry before the next one was laid over it. After the gessoing was complete, two more layers of finer gesso were laid over, and the panel was put aside to dry for several weeks until it was very hard. Next, the gesso surface had to be scraped and sanded until the painting surface was perfectly flat, even and smooth. After the artist created the drawing for the panel, she carefully incised it into the hard gesso with a finely sharpened chisel. Now the panel was ready for gilding. Gilding: In the gilding tradition, water gilding is the finest quality gilded finish, creating the most brilliant mirror image possible. Parun performs the craft of gilding in the same manner as it has been performed for over 3,000 years. In the Italian gilding tradition, a red clay called “bole” was prepared by cooking it for a specified time, laid over the white gesso surface, thus preparing the gesso to receive the gold leaf. The bole was then polished with an agate burnisher. Three layers of 23K gold leaf were then laid layer by layer and burnished to a very high finish. Next the oil painting was done over the gesso in the areas her design required. Framing: The frame was designed, milled and crafted in New Orleans by Ms. Parun with the same excellence of craftsmanship as was the panel. She made the gesso, laid 10 layers on the wood, let it dry, scraped it smooth, incised her drawing into the frame panel, applied the red bole, and gilded it with 23K gold leaf in the same traditional way as she did for the panel. Ms. Parun elected a bright gold finish for this frame. ​Reviving three lost gilidng arts, Phyllis Parun distinguished herself for her fine gilding craftsmanship. Her figurative work is known for transforming the gilder’s art into a fresh, new contemporary art form. 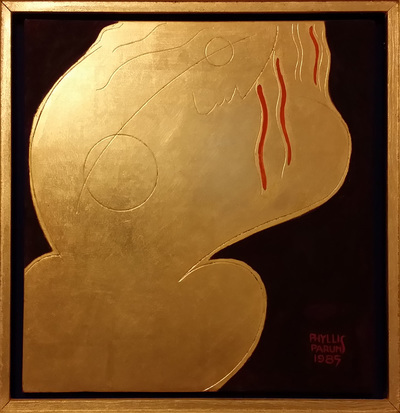 The artist made only one series of eight gilded panels between 1984 and 1985, and four are in private collections.